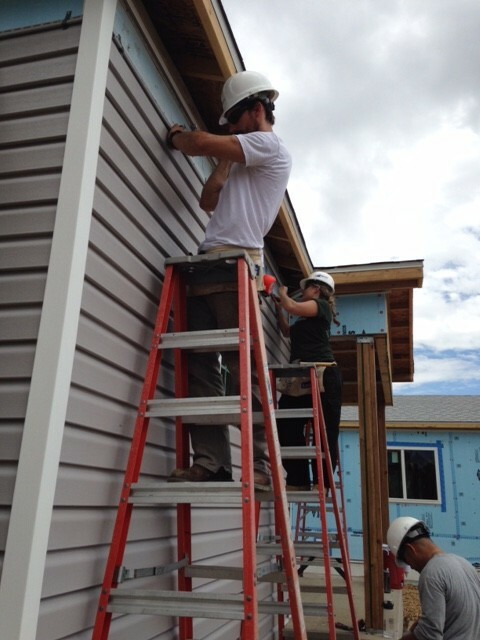 FORT CARSON, Colo. -- Evans Army Community Hospital's Junior Officers Council came together August 6, not only to build cohesion, but also to help build a house for the Pikes Peak Habitat for Humanity. "Spending our Saturday volunteering with Habitat for Humanity was a great opportunity to give back to the community," said Cpt. Mallory McCuin, president of the hospital's JOC and the clinical nurse officer in charge of the hospital's labor and delivery ward. "And it was also a great team building experience that we are looking at doing at least quarterly." The Evans council gives captains and lieutenants in all medical specialties a chance to hold leadership positions and to plan activities for the organization and in the local community. During their monthly meeting they have a senior officer to give leadership and professional development on topics such as finance, board preparation and broadening opportunities. The JOC decided on this community outreach event, when one of their board members told them of her previous experience with the organization. The council then contacted Habitat for Humanity and signed up for the 3.5-hour shift. 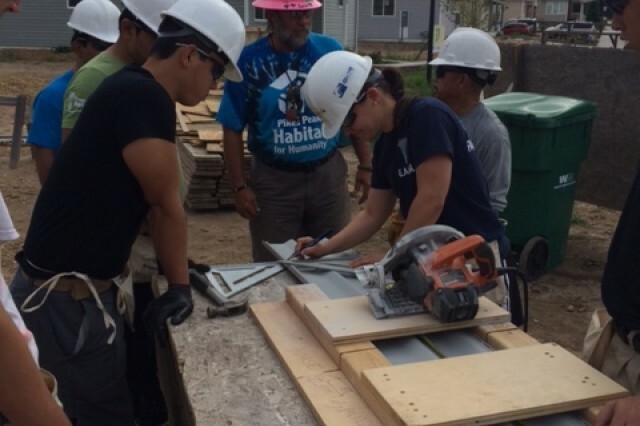 After arriving at the Habitat's Country Living neighborhood in Fountain, the Evans' officers and their spouses received a safety brief and on-the-job-training. The work slated for their shift was hanging siding and pulling weeds. When complete this neighborhood will be home to 34 low-income families. "I learned a lot about the Habitat for Humanity program because of us doing this project," said McCuin. "I thought that people were given a free house." The Habitat for Humanity foreman told them about the lengthy process that prospective homeowners must go through to be selected to receive a home. He told them that after applying, and being selected, the future homeowner must complete 500 hours of community service with Habitat for Humanity. And after that they are not just "given" the home, they have a zero interest, 30-year mortgage they have to pay. The mortgage payments are used as a revolving fund for building more homes. Since the Pikes Peak Habitat for Humanity was founded in 1986 they have built or rehabilitated homes for over 118 low-income families. "We weren't helping to give them a hand out, but just helping them," McCuin said. "It is nice to know that they (the future homeowners) are also giving back." 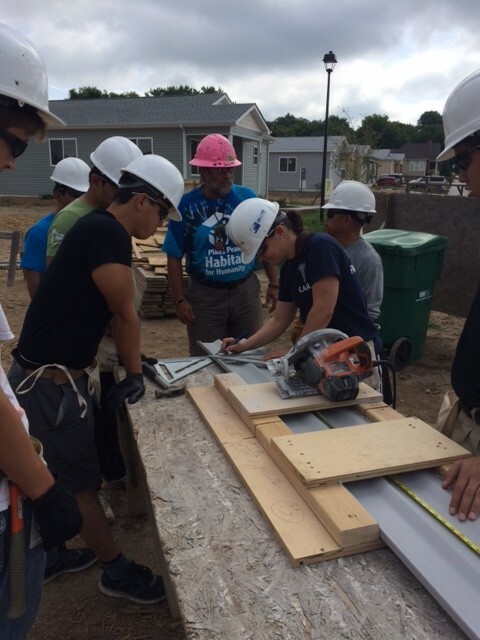 During their shift the junior officers worked alongside a future homeowner who was also volunteering at the build site. "It was cool to work side-by-side with this other group of volunteers, because one of them was going to be a recipient of a Habitat for Humanity home," McCuin said. According to the Pikes Peak Habitat for Humanity website (www.pikespeakhabitat.org) it takes about 3,000 hours to build a Habitat home and volunteers contribute approximately 22,200 hours a year at Pikes Peak Habitat for Humanity. 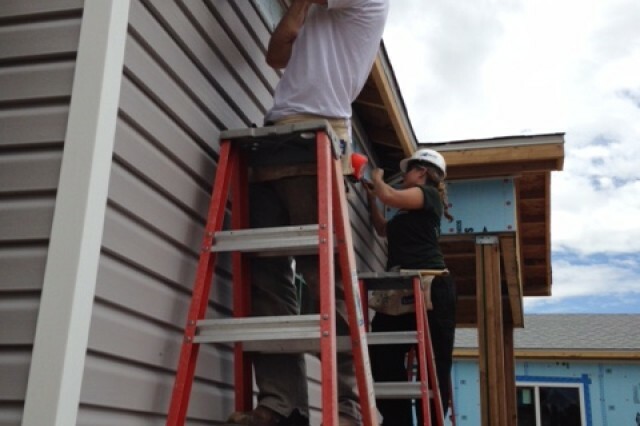 It also states that no significant construction or volunteering experience is not needed and many of "our volunteers have never picked up a hammer before coming out to the Habitat for Humanity site". "This is a wonderful program and right in line with what the JOC is all about -- reaching out to the community," McCuin said. "As an officer, especially as junior officers, we have to understand that there is more than just wearing the uniform and coming to work. You have to form the relationships with the community and set the example."